Warning: These are highly addictive and get gobbled up fairly quick.I would strongly recommend making a double batch of these babies…These make a great hamper for occasions and gifting too.I have never been a fan of peanut butter but can quite easily say, have now become a convert. PS:Stay tuned for a special Blog Anniversary post coming up soon. 1. In a medium bowl, mix together butter and peanut butter until well combined. Next add in the powdered sugar and mix really well until a smooth dough forms. Form dough into 24 balls and place on the prepared baking sheet. Now place the tray in the freezer for about 25 minutes. Using a double boiler now melt all the chocolate and keep aside. Remove peanut butter balls from the freezer and coat each ball with the melted chocolate. Place into the freezer for 2 minutes.Remove while it is still unset and coat with either the crushed peanuts or coloured sprinkles and keep back in the freezer for 15 minutes. These would make the kid in all of us happy. Wow ! 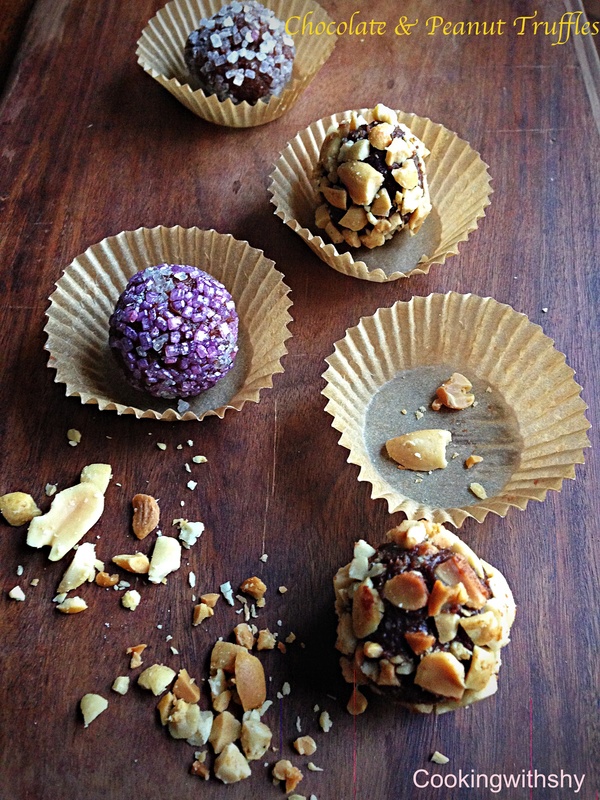 Gorgeous truffles ! !